For most of us, our phones are the center of our daily lives, and as a result, they contain a treasure trove of personal information, from banking details to messaging and email accounts. This sensitive data can be pretty enticing to a range of the nefarious, from cybercriminals to someone you may even know. Phone hacking can involve the unknowing download of spyware that relays information on your activity – such as logging keystrokes to scrape passwords; spy apps downloaded by someone with access to your device; or other malware that exploits your phone, for example by using its internet bandwidth in a botnet, as occurred with malware that affected nearly two million Android devices. “The most common way that smartphones can be hacked is to infect the device with malware,” says Victor Chebyshev, a security researcher at Kaspersky Lab. This malware can arrive on the device buried inside apps downloaded by the user – and the likelihood of a malicious app rises when downloading away from the official app stores, which police their content. While iPhones aren’t immune to hacking, Apple’s strict vetting policy means the incidence of bad apps targeting iPhones (at least non-jailbroken ones) is lower than for Android phones. “Android devices are more susceptible to these kinds of attacks because they have the option to install applications from third parties,” says Chebyshev. A sluggish phone or fast-draining battery are common symptoms of a compromised phone – but they can also indicate your device needs a spring clean to spruce up performance or improve its battery life. Another red flag is if your data usage has gone through the roof – this could indicate a dodgy app is sending data back to its mothership. “Whether a user can determine who is responsible for a compromised phone depends on what kind of threat was on the device,” says Chebyshev. To narrow down the field of suspects, you can try to determine exactly how your phone is being compromised. Are you being charged for premium-rate texts you never sent – or texts you never signed up for? You’ve probably been infected by malware that forces your phone to send or receive texts that generate revenue for cybercriminals. This common form of mobile malware is believed to be the first type found targeting Android, back in 2010, and today plenty of it is still floating around. If you’re receiving premium-rate text messages, try texting STOP to the number. If this doesn’t work, you’ll have to contact your cell carrier who should be able to block the number. If your phone is sending the texts, you may be able to fix it by running a security app such as Lookout which will remove malware (Android only). Try deleting any third-party messaging apps and any other apps you installed before the phone started sending the texts. If there are any apps you don’t remember downloading, look them up online to see if any of them have been reviewed negatively for malware or other suspicious activity. In this case, the apps will have been compromised by a hacker who likely isn’t targeting you personally but is distributing malware with the aim of scraping as much data as possible. The BankBot malware, for instance, was a trojan that infected hundreds of Android apps to display a phishing screen to steal users’ banking credentials. Got a phone full of apps and can’t remember for sure which you downloaded? Some categories of apps have attracted more than their fair share of malicious actors – several flashlight apps on Google Play were infected with malware that tried to scrape users’ financial info, while one should be wary of battery-saver apps as they have often been used for malware, says Josh Galindo, director of training at phone repair service uBreakiFix. Android: Commercial spyware is unfortunately all too easy to find online. Such spy apps have system-level access to extremely detailed information about your device activity such as the messages you write, photos you take and GPS location. They also need to be downloaded physically to your device – which means if they’re on your device it was done by someone with access to your device (and your PIN). Chances are, you can figure who in your life would want to monitor your phone. Done all of the above and still convinced that someone somewhere has your personal data, siphoned from your smartphone? Apps aren’t the only way a phone can be infected by malware. Have you picked up any random calls lately? “Callers offering a free cruise or claiming that you won a sweepstakes are likely scam efforts to hack your information or record your voice,” says Galindo. 6. Did you click that link? If you recently clicked on a link on a text message or an unexpected pop-up, you may have inadvertently fallen prey to phishing. One scam last year involved a fake virus alert that contained a Remove Virus button that took users to a link to download “security software” or call “tech support” – with the intent of getting victims to reveal personal information to the other end. It’s often impossible to divine who is behind such scams, although you can report any phishing texts to your cell carrier and block these numbers. According to Kaspersky Lab, one in four hotspots are unsecured, and even the ones that are password-protected could potentially be set up by someone with malicious intent. If your phone isn’t protected by a VPN and you logged into an unsecured public Wi-Fi hotspot, it’s possible someone could have been spying on the connection – and scraped your sensitive information if you logged into your email or bought something online. If this fixes any performance issues, great. Even if not, it’s a good idea to clear your device of apps that may have been flagged by that security scan you did. 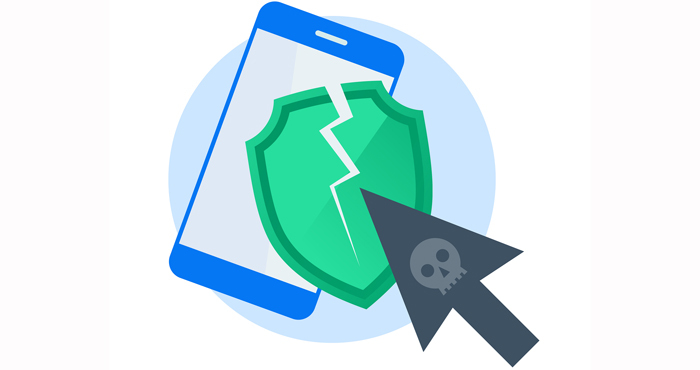 If after deleting the suspicious app(s) your phone is still behaving strangely, this nuclear option is a quick way of clearing your device of malicious – or sluggish - software left behind. Unfortunately, many hacks and malware present few to no symptoms and often the only time people are aware of a breach is when their digital services are hacked, or, worse, they’re the victims of identity fraud, where hackers have used their stolen information to open accounts or lines of credit. There are a few tools you can use to check if any of your information has already been compromised. Have I Been Pwned? is a website run by security developer and Microsoft Regional Director Troy Hunt that checks if email addresses have been exposed in breaches of popular apps and services. We also like the Dashlane password manager, whose Premium version (from $3.33/month) scans the Dark Web for instances of your emails or logins being posted for sale. If you find that your logins – particularly passwords – are floating around online, the first thing to do is to change your passwords. The best way to do that is to use a password manager which can automatically generate and save complex, unique passwords for each of your accounts. Check out our top-rated picks here. Depending on the scale of the information that has been exposed, you may want to set up a fraud alert at the major credit agencies, which will require any potential creditors to request additional verification of your identity.